Swiss-Belhotel Internationa has celebrated the launch of a stylish new upscale resort at Tanjung Binga, the idyllic beachfront destination on Indonesia’s Belitung Island. Swiss-Belresort Tanjung Binga soft-opened on 29th January, 2019 with a major ceremony attended by The Minister of Tourism – Dr. Ir. Arief Yahya, M.Sc., The Vice Governor of Bangka Belitung – Drs. H. Abdul Fatah, M.Si and the Regent of Belitung – H. Sahani Saleh, S.Sos, The Vice Regent of Belitung – Isyak Meirobi, Board of Directors and Commissioner PT Tanjung Binga Sejahtera, Swiss-Belhotel International Executive Director – Matthew Faull and Senior Vice President of Operations and Development for Indonesia, Malaysia and Cambodia – Emmanuel Guillard. This grand occasion included speeches, performances before concluding with an official ribbon-cutting ceremony. “We are delighted to be here in Belitung to celebrate the opening of Swiss-Belresort Tanjung Binga, our stylish new seafront resort. This is an exquisite beachfront destination with many natural wonders, including rocky beaches and turquoise seas. We look forward to bringing Swiss-Belhotel’s timeless values of international hospitality to guests in this spectacular setting and contributing to the long-term prosperity of Belitung,” said Gavin M. Faull, Chairman and President of Swiss-Belhotel International. Guests have a choice of F&B options, from relaxed indoor and outdoor dining to casual bites and 24-hour room service. The Swiss-KitchenTM Restaurant is overlooking to the pool and the sea, it’s a contemporary all-day eatery designed in a rustic “barn-by-the-sea” style with reclaimed wood and high ceilings, while the Lobby Lounge and Poolside Bar are the perfect venues to enjoy relaxing refreshments at any time of day. Alternatively, guests can simply chill out at the Beach Club whilst gazing out over the azure waters of the South China Sea. 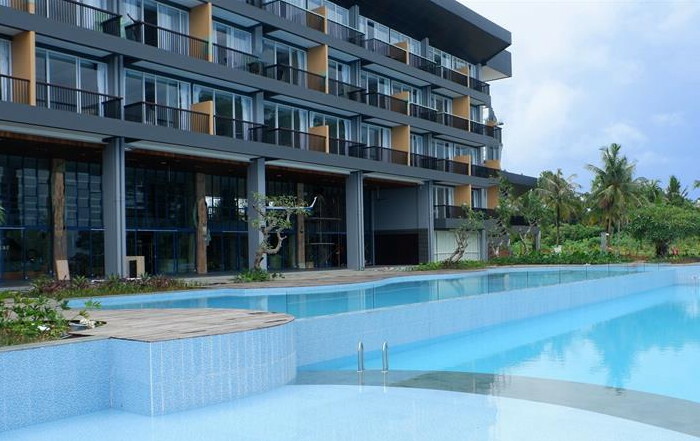 Swiss-Belresort Tanjung Binga features a range of leisure facilities, including an outdoor swimming pool and kids’ pool, a serene spa, 24-hour fitness centre and a jogging track. Swiss-Belresort Tanjung Binga is located just over 45 minutes’ drive from HAS Hanandjoeddin International Airport, the main air gateway to Belitung which offers direct connections to and from Jakarta (1 hour), Pangkalpinang (35 minutes), on the neighbouring island of Bangka and Singapore (1 hour and 30 minutes).